Typical basement floors are hard, cold concrete. Since concrete is porous, ground moisture continually makes its way through, contributing to the humidity in your basement. Other products (ceramic, stone, or marble tile) are grouted to the concrete and are difficult and expensive to repair or replace. When traditional flooring materials like organic carpeting, chipboard and wood are placed on a concrete basement floor, moisture collects between the flooring and the concrete floor. Over time that moisture will be absorbed by the materials on top and lead to mold, rot, and musty odors. At Bowman Masonry & Waterproofing, our basement flooring options are all made specifically for concrete basement floors. When installed in your home, our flooring options will never rot, decay or support mold growth. All of our flooring products are designed to easily interlock for quick installation without grout or adhesives. The interlocking flooring is ideal for basements since the flooring can be picked up and reinstalled if water gets underneath. Combined with our other basement products, and our basement waterproofing system, it's a great way to upgrade your home! With a one-day installation, you can add beauty, comfort, and value to your home with our finished basement flooring. For a free basement floor quote, call or e-mail us today! 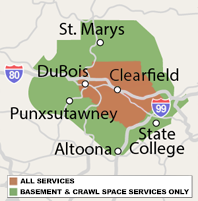 We proudly service Pennsylvania, including Clearfield, Reynoldsville, Brookville, Curwensville, Punxsutawney, Philipsburg and nearby areas. At Bowman Masonry & Waterproofing, we're proud to provide five different basement flooring options with a variety of color and texture choices. How you finish your floor will define the mood of the new space, and it can easily make or break the ambiance of a room. If you'd like a free quote for basement flooring with no obligation, we'd love to help you. Contact us today to get started! ThermalDry® Basement Floor Matting is perfect for homeowners who want to install wall-to-wall carpeting in their finished basement. By installing this underneath your carpeting as a subfloor, you protect it from moisture from the concrete below. MillCreek Flooring™ uses a patented process that gives the same look, feel and touch as a hardwood floor, all while being suited for basement environments. This synthetic wood floor includes a 10-year limited warranty. Available in Natural Oak and Mahogany designs. ThermalDry® basement floor tiles are engineered specifically for basement environments. Unlike ceramic basement floor tiles, ThermalDry® basement flooring will never crack or shatter. Available in Sandstone and Canyon Beige. ThermalDry® carpeted floor tiles are designed to keep your basement floor warm and dry. Unlike a long blanket of carpeting, damaged or worn tiles can easily be replaced. Available in Charcoal and Mocha designs. ThermalDry® parquet floor tiles provide the beauty of parquet flooring with all-inorganic materials. Enjoy the beauty of a parquet wood floor while resting assured that your floor is safe from moisture and humidity. ThermalDry® Insulated Floor Decking™ is a unique basement subfloor that combines inorganic, waterproof flooring with insulation for exceptional warmth and water resistance. Pro Comfort Carpeting is an innovative basement carpeting option that is made from completely inorganic materials to ensure a long lasting, waterproof solution.